GOOD MORNING & Welcome to another FABULOUS PEACHY KEEN CHALLENGE! Today's sketch was inspired by the SUPER TALENTED, Lori Souther's adorable card found here! Love that sweet little turtle. What a fun cheery card. 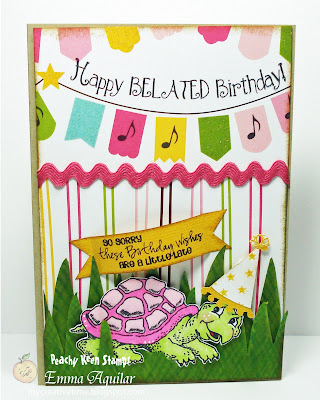 Love the bright colors and the paper really is darling! The sentiment is just perfect too. Looking forward to playing along. Wow Emma! What a super duper card! LOVE the way you used the DP and that banner is the business! 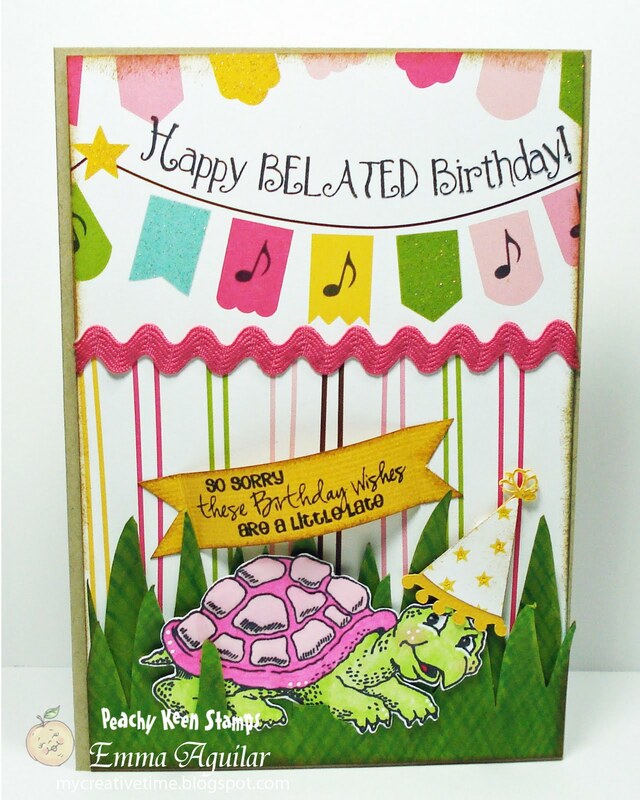 Perfect backdrop for your oh so cute Turtle! Emma, this is do bright and cheerful! I am in LOVE! But again when am I not with your creations! OMG... I was just going to ask where you got that paper! Between PKS, you and MSS you are going to take me broke! Just simply the happiest card! I love your birthday turtle! So cute! I would never have thought to color the shell pink. Great job as always! Your Card is Adorable like always Emma. I love it. Girl....You are amazing! So cute! Love the colors and the image and....well, everything! Great card, Emma! I love that you did a pink shell on the turtle! That's just too creative and cute. The party hat is great, too, and the way you did the grass is fabulous! Bright, beautiful, and perfect in every way!! Great Birthday cards!! I love the one in silhouette the best!! I'm going to go check-out the Peachy Keen store! !